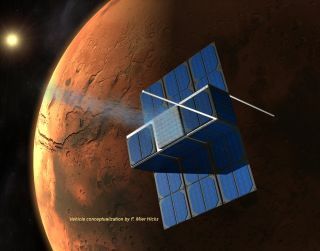 A group of students are developing a mission that would land three spacecraft (one pictured above) carrying images of Earth to the surface of Mars. Image uploaded April 25, 2014. A group of students wants to send a time capsule filled with images and sounds from life on Earth to Mars. The project, called Time Capsule to Mars, aims to develop and load three small, identical spacecraft with photos, messages, audio and video provided by people from around the world. By launching the small probes on a mission to Mars with messages aboard, the creators of the project hope to leave mementos of life on Earth for future humans traveling to the Red Planet. Time Capsule to Mars will be a crowdfunded project. People around the world will be able to send in their messages for as little as 99 cents, according to Briere. The more space a message takes up, the more a person will need to pay to send it to Mars. For example, videos will likely cost more to send than photos or text. Once collected, those messages will be copied onto the small satellites before launch. "When we get to Mars, we're going to deploy the payloads," Briere said. "We're not trying to preserve the spacecraft itself. They will disintegrate in the atmosphere. The payloads are designed to aerobrake and self-land on the surface of Mars without damaging the data. Then, your pictures, videos, 'you' will remain on Mars until future colonists get there to discover you." At the moment, the Time Capsule to Mars team doesn't have an official timeline; however, they're hoping to be the first private team to successfully land something on Mars. Briere estimates the total cost of the mission at about $24 million.